To open the pages of László Krasznahorkai’s Satantango is to become stranded in a tiny, claustrophobic Hungarian village, a backwater of rain, mud, mist, mildew, and rust, where rumor and superstition serve as hard data. It rains for all but the last thirty pages, giving Satantango the feeling of a terrarium with an ecosystem gone amok. “We are living in apocalyptic times!” declares Bible-thumping Mrs. Halics. 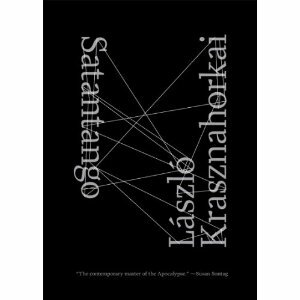 There’s a retrograde, stripped-down feeling to Krasznahorkai’s universe. In Satantango there’s a single television set in the local bar (although it never seems to work), a truck and a bus. But there is no telephone, no car, no internet. Nevertheless, his maniacally inventive writing can take on a breath-taking expansiveness, balancing the bitter, alcohol-fueled lives of his villagers with moments that attempt to describe the scope and scale of the universe. He can be apocalyptic, tragic, comic, tender and vulnerable, all in a single burst of words. The entire end-of-October night was beating with a single pulse, its own strange rhythm sounding through trees and rain and mud in a manner beyond words or vision; a vision present in the low light, in the slow passage of darkness, in the blurred shadows, in the working of tired muscles; in the silence, in its human subjects, in the undulating surface of the metalled road, in the hair moving to a difference beat than do the dissolving fibers of the body; growth and decay on their divergent paths; all these thousands of echoing rhythms, their confusing clatter of night noises, all parts of an apparently common stream, that is the attempt to forget despair; though behind things other things appear as if by mischief, and once beyond the power of the eye they no longer hang together. At dawn, after a long night of quarreling, licentiousness, and dancing to an accordion player who plays the same tango over and over (“nobody noticed”), Irimiás finally appears, bearing the terrible news that a young girl from the village has just been found dead (a suicide with rat poison). He gathers the villagers around him in the bar and embarks on a sermon about sorrow and guilt, hope and redemption. But phrase by phrase, his eulogy slowly turns from the “incomprehensible tragedy” to the promise of “a fairer, better future,” and his eulogy starts to sound like a familiar messianic swindle. Not surprisingly, the only thing lacking to pull off his plan for the villagers’ salvation is money. Urged into a fit of optimism by Irimiás’ proselytizing vision, most of the villagers abandon their homes and head toward a decaying, empty manor house, where he has promised them a new start. But after a miserable first night, the villagers begin to doubt Irimiás, feeling “deceived, robbed, and humiliated” by his failure to appear as promised. Irimiás, who has the perfect timing – and the sartorial heritage – of Clint Eastwood’s Man with No Name, suddenly appears at dawn. Irimiás stood there. His seal-gray raincoat was buttoned up to the chin, his hat drawn far down his brow. He stuck his hands deep into his pockets and surveyed the scene with piercing eyes. A cigarette dangled from his lips. There was a stony silence…”I asked what’s going on?” Irimiás repeated threateningly. Later on, however, we discover that Irimiás is actually not all that different from the village doctor, when we learn that Irimiás, too, maintains his own set of written observations on the villagers, which he submits to a group of distant clerks, who, in turn, are expected to rewrite his surprisingly frank commentaries into a suitable report for their bosses. In a chapter rife with humor and irony, Krasznahorkai lets the clerks squirm as they translate and sanitize Irimiás’ “depressingly crude scrawl” into officialese. Reading Satantango is to watch Krasznahorkai working through his own position as a writer. Might the act of writing just be another folly in the face of despair, Krasznahorkai asks? And so the words prepared for the occasion tumble over each other and began sparring round as in a whirlpool, having formed the occasional frail, if painfully useless, sentence that, like a mostly improvised bridge, is capable of bearing only the weight of three hesitant steps before there’s the sound of a crack, when it breaks, and then with one faint, final snap collapses under them so that time and time again they find themselves back in the whirlpool they entered last night when they received the sheet with its official stamp and formal summons. But in the end, it is the doctor, abandoned by the villagers and bereft of anything to observe and record, who has the final say. After the villagers’ disappearance, he suddenly begins to imagine their lives in order that he might somehow continue to write in their files. …he knew, was deadly certain, that from then on this was how it would be. He realized that all those years of arduous, painstaking work had finally borne fruit: he had finally become the master of a singular art that enabled him not only to describe a world whose eternal unremitting progress in one direction required such mastery but also – to a certain extent – he could even intervene in the mechanism behind an apparently chaotic swirls of events! The power to fictionalize, or, as he calls it “focused conceptualizing,” the doctor realizes, is a weighty responsibility, but one that makes him “the wielder of mesmerizing power” and master of his own destiny. And before too long, the doctor begins to write the very book we have just finished reading. Written in 1985, Satantango was Krasznahorkai’s first published novel in Hungary. With the international successes of War & War and The Melancholy of Resistance, it’s great to see older works like this start appearing in English. While I can’t vouch for George Szirtes translation from the Hungarian, he has helped Krasznahorkai deliver three amazing books for English-language readers. See all my posts on Krasznahorkai here. I haven’t read the book, but I have seen Bela Tarr’s 8 hour film based on the novel, a masterpiece of film art. Congratulations on your website, which I have found most interesting on both WG Sebald and other writers too.